While, as the previous chapter argues, Rome and Sarras are tied to each other and to the way the British imagined their own history in myriad ways, France was a far more intimate inf luence on English history, identity, and desire. Ardis Butterfield is one of many scholars who have documented how closely tied England and France were, and how important the context of the Hundred Years’ War is for late medieval literature.1 Although the origins of the King Arthur story may lie in early Welsh and Latin chronicles with their origins in Britain, it was French authors from Chrétien de Troyes forward who fundamentally shaped the Arthurian legend; it was in response to the continental treatment of the story that Malory undertook the monumental effort to render the “French book” into English, and in the French book, a French knight, Launcelot, rose to prominence, surpassing even Gawain. 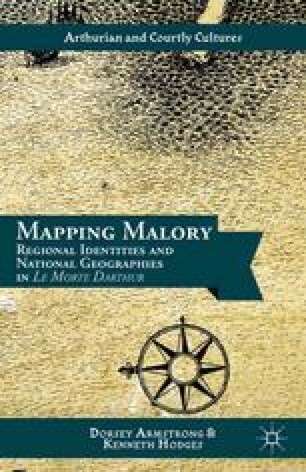 The strong French component to the legend of the great British (or English) king complicates efforts to read Malory’s work in a national context, but as we have been arguing throughout this book, that “complication” is perhaps one of the most interesting and important aspects of the text.